There is a vacancy at the top of the bantamweight division. TJ Dillashaw vacated the title after an “adverse finding” in a drug test administered by USADA and NYSAC after his flyweight loss to Henry Cejudo and now fighters are trying to find their way into a bout for the unclaimed strap. One of those men is Pedro Munhoz, who recently dispatched former bantamweight champion Cody Garbrandt at UFC 235 via first round knockout. UFC president Dana White revealed after the Fight Night Nashville card that his plan is to have flyweight champion Henry Cejudo fight No. 1 ranked bantamweight Marlon Moraes for the vacant strap, though nothing official was announced. Munhoz believes he should be the man to oppose the top ranked bantamweight for the title. Part of the heat between Cejudo and Moraes is a back and forth battle that the two fighters have waged on Twitter. Munhoz is not much of a trash talker or Twitter user, instead letting his fighting do the talking, though he sees now that he may have to get back on the social media platform if that’s the way to get his name into the title picture.
.@danawhite I know the TJ situation disappointed a lot of @ufc fans. Make it up to them and book me and @MMARLONMORAES and we’ll deliver a classic. It won’t go 5 rounds. Guaranteed. 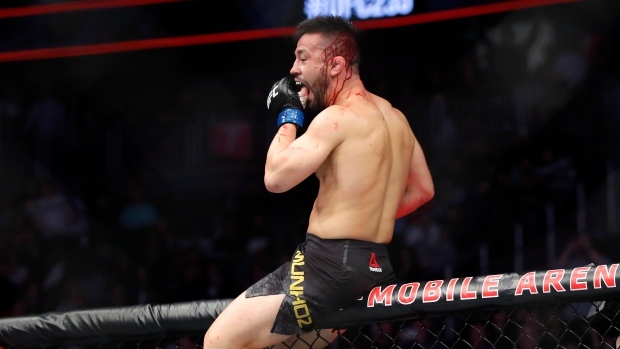 While many other fighters have piled on Dillashaw or claimed that they were suspicious of the two-time champion, even before he tested positive, Munhoz did not join the chorus, instead taking a live and let live approach. When he found out about the positive test and the vacant title, Munhoz did believe it was a massive break for him, especially considering his recent win and who he beat. “My first reaction was, ‘oh man, I think it’s going to be my time now’, Marlon is number one and I’m number four, but that four doesn’t make sense because I just knocked out the former champion and literally a week before the fight Cody Garbrandt was number one ranked and I was number nine,” said Munhoz. One fighter that has been trying to get Munhoz’ attention is Petr Yan, a fighter on a seven-fight winning streak, including his most recent victory over John Dodson at Fight Night Prague. Munhoz believes they’ll meet one day, but right now is concentrating on either a title or a number one contender fight.